I have reached a crossroads in my life. A point where I realize I’m no longer the little girl playing in her sandbox. I’m no longer that teenager listening to her music as loudly as possible and wallowing in self-pity. I’m not even that college girl inspiring all her sorority sisters to get involved, be motivated and to love each other. I am however, old enough, to be totally and completely excited about receiving my new vacuum in the mail today. That’s right. I’m excited about a vacuum. This is certainly a turning point for me. Where I have to fully accept that I’m an adult with responsibilities like keeping my house clean. I won’t say that I’m excited about having to clean my house, but having a new vacuum will certainly make it more “fun” than….NOT having a new vacuum? Whatever. Stop rolling your eyes at me. I’ve been researching vacuum’s for awhile now. Trying to talk to people, figure out what might work best. Definitely a far cry from past conversations like “What’s your favorite drink?”and “OMG – did you hear that so and so broke up?” I’m so grown up. We have basically all hardwood floors in our house – and with 2 big dogs who have doggy door access 100% of the time, a husband who tracks in mud and dirt from mountain biking on a regular basis and just daily life – I feel like I’m constantly sweeping, dusting, sweeping, mopping and wondering why there is STILL so much dog hair on the floor when I just swept…and it’s an endless cycle. It was time to pull out the big guns. I bought a Dyson. Not just any Dyson, it’s a DC35 series – a cordless vacuum with lots of attachments to help with under the couch/bed areas, different surfaces (so i can use it for our areas rugs and hardwood/tile areas), and it even has an attachment to focus on your floorboards which is a constant nightmare for me. Doesn’t it just look cool? I read a lot of reviews about it, and most of them were pretty positive. I have decided that 100% of the people will never be happy 100% of the time. So you have to take reviews with a grain of salt. I’m pretty sure Abraham Lincoln said it more eloquently and he WASN’T talking about vacuums but the thought process still works for me and I’m going with it. It charges quickly and has a lot of power. And I think I mentioned my excitement over the variety of attachments. I also got it on a woot.com special and saved over 100$. That also makes me one happy yet very adult girl. It should arrive today and I have a feeling I may move “vacuuming” up on my chores list instead of waiting until the weekend. Watch out people, party at my place. Just be sure to wipe your feet before entering! Filed under family, just for fun, Life, product alert! So today will be work out #4 on my TurboFIRE plan. It will be Workout #5 in terms of my week. I did take Wednesday off (the program wants you to take one day off) – so that was nice break. But last night I was right back in my workout room – doing some cardio and getting my sweat on. I was able to choose the option “pump the music” since I’d done this workout once before and it made it more fun. No need to explain the spiderman thing, right? I ordered new shoes because I feel like my current shoes aren’t the right type for all the lateral movements, pivoting and really – the intense amount of jumping. So I got some New Balance Cross Trainers. 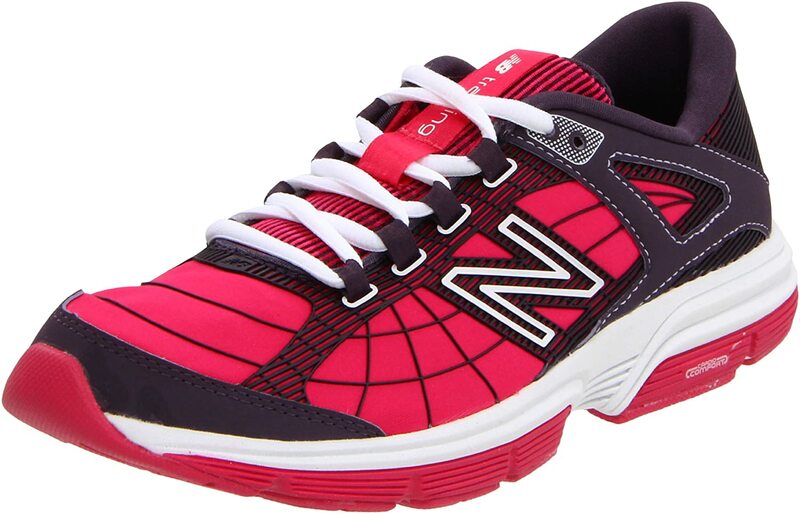 I will henceforth refer to them as my Spiderman shoes. They should be arriving in the next few days – so I’ll let you know how they do. I was looking for keywords in the reviews like “cushioney” – although, that is not a real word. But you get what I mean, right? I also ordered a Jump Mat for my home gym because again – my feet are like little cry baby feet and they hate jumping. Or rather, the landing part. But i know I’ll get more results if I push myself to do the jumps and stuff – so I’m doing whatever I can do to make it easier on my joints. This weekend is like the motherload of holidays for me because of how I feel about chips and salsa. So I’m not making any promises that I won’t indulge in some Cinco de Mayo celebrations – but at least this weekend I’ll be doing some intense workouts to help make up for it. I figure that’s the real key to this whole “changing your life” thing – is finding ways to still live a normal life. So if I want to be a crazy person and drink a margarita, eat chips and salsa and probably guacamole (let’s be for real) all on the same day – I just need to accept that I probably need to work out first on that day. I think I can handle that. 2) Group bike ride tomorrow – haven’t decided which group i’m going to ride with, but will probably ride about 20 miles. Plus a 30 minute cardio & 10 minute stretch for TURBOfire. 3) Sunday is a new Turbo workout – i think it’s a Core and Stretching. Somewhere in all of this – I also need to learn the new round of choreography for my TurboKick class on Tuesday. Man. I’m going to deserve those chips and salsa for once! Okay – have an ACTIVE and happy weekend. See you on the flip side! Well, I did get my hair cut and I guess we’ll see how much I love it when I try and style it the first few times. But the title of my blog post today isn’t about my hair – it’s about my new and awesome header! Check it out! My husband is an awesome graphic designer/marketer and he made me a custom header to represent what I’m trying to do here on this blog. So far, blogging has been pretty fun – but I wish I had a dedicated amount of time to spend here every day. I feel like it’s easy some days, and impossible other times to get here to post. Also – i don’t like to post something unless i have something interesting or clever to show you! I went shopping today. After a few weeks of my new eating plan – I realized that my standard lunch bag was not cutting it. 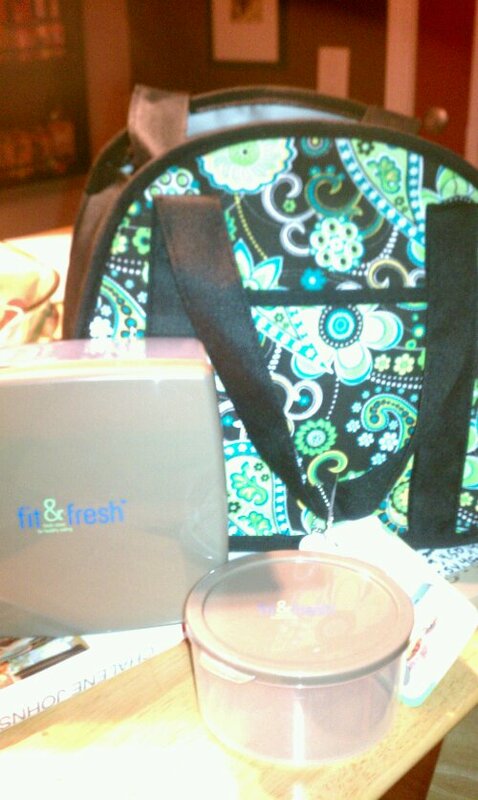 I blogged about the Fit and Fresh products a few weeks ago (which btw – are awesome for carrying around snacks easily!) and when i was at HomeGoods today, they had Fit and Fresh lunch bags with a few t0-go containers inside. My lovely photo taking abilities allows you to see it below here. I am always excited to find new products that help me achieve my goal. Bringing my lunch every day to work (as well as my breakfast and snacks) gives me 100% control over what I’m eating every day. It’s a lot easier to make the right decision about what you are eating when you have it right there with you already.